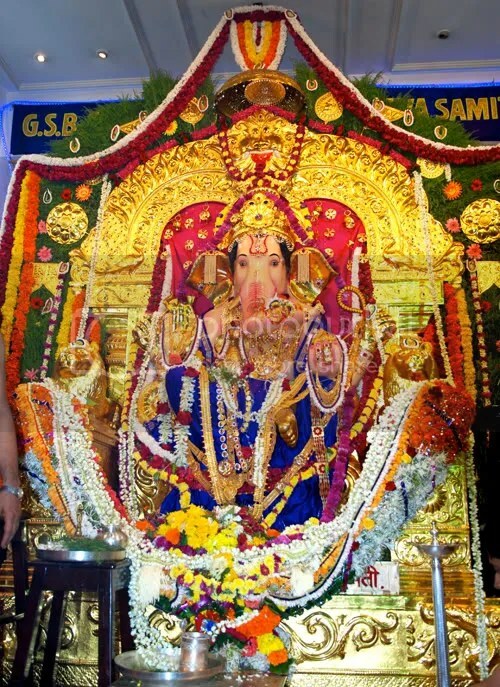 Ganesh Chaturthi (or Ganapati Chauti as we Konkanis call it) is THE celebration in our extended family home in Mumbai. During the five days of Ganapati, all pujas are performed as prescribed in the Puranas, including recitations from the Vedas. After a busy five days, the murthy is consigned to the seas (visarjan), leaving us all melancholy. Even Meera was puzzled that beautiful “Ganapati Bappa” was missing. He’ll be back next year, Meera! And so will we all. See an earlier post for a brief background on Ganapati. The murthy is brought home, the day before. 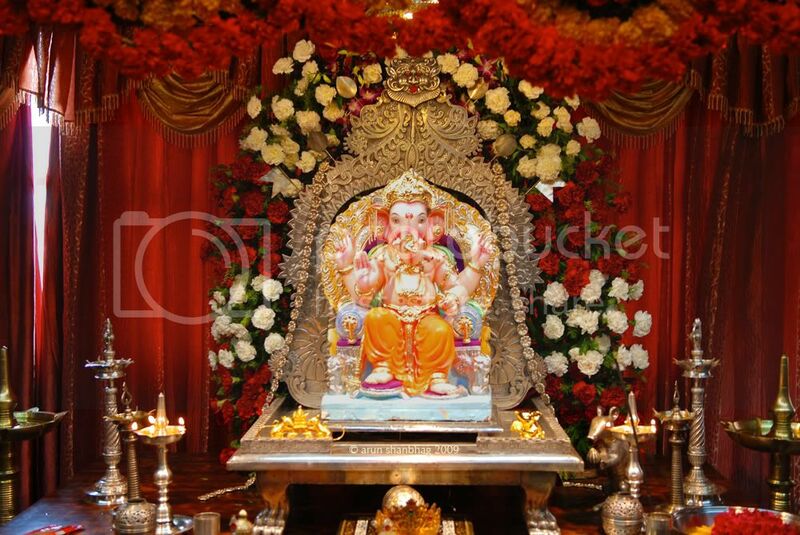 In this first pic, Ganapati has only been kept in place. 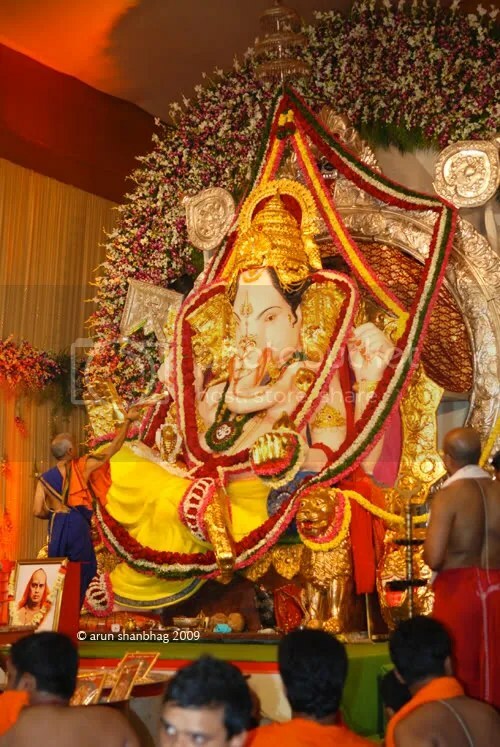 During the first puja, the murthy is dressed with flowers and with the recitation of chants, sanctified with the divine presence. During aarti on the last (5th) day. The two GSB (Konkani) Ganesh murthys are among the top 10 in Mumbai! 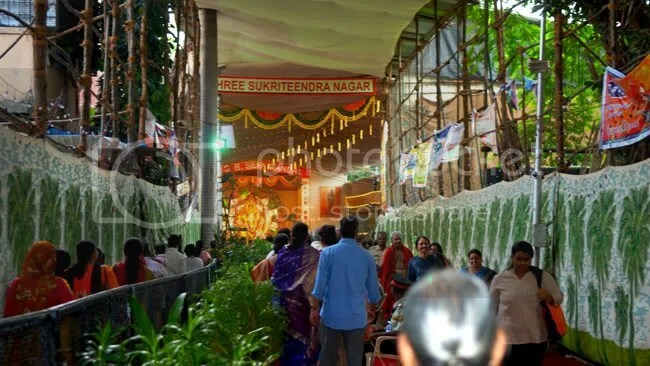 This one at the GSB Seva mandal, King Circle, Matunga is among the largest and draws nearly 200,000 visitors each day. 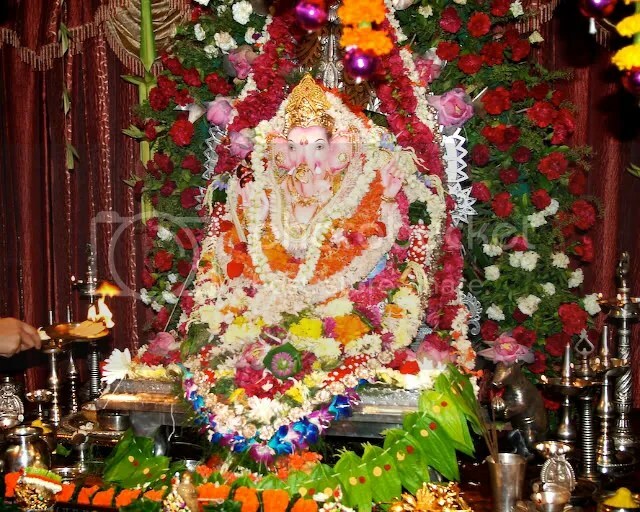 Unlike other pandals, here pujas are performed as per tradition, and devotees often talk about the strong divine presence at both these sites. The demand for puja services here is so great that 50 additional GSB priests come in from Karnataka to help out. Apparently 2,500 Gana-Homams (Yagnas or Havans) will be performed over the five days. Services typically start at 7 am and don’t stop till 10 pm. Here, aartis are performed essentially non-stop all day! Here is peek into the onsite storage area for coconuts and jaggery to be used for prasad. 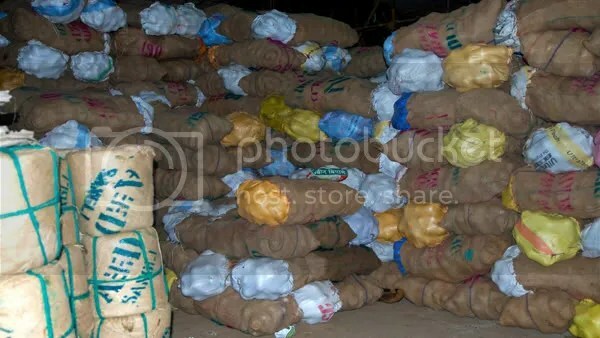 The organizer estimated they will be breaking 125,000 coconuts during the fives days and nearly a 100 kgs of jaggery will be used to make the prasad. For the first day alone, they need to prepare 45,000 warm and delicious appams to be offered to devotees as prasad! This is my favorite Ganapati in town! I have come here since I was a toddler. Our family has pujas scheduled here for nearly 50 years! And it seems the murthy has not changed since then – except for more bling! I just love this Ganapati! Click and download a larger version for your desktop! Also traditional at Wadala to gorge on hot bajjiyas after taking darshan! so beautiful, arun – the photos are so very colorful, it is a glimpse into another life, for me. thank you for sharing! 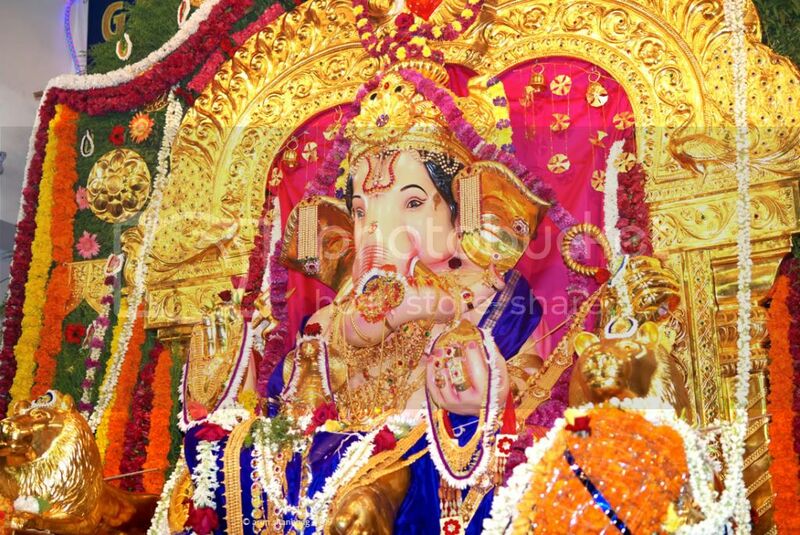 Thanks for sharing the most loved Ganapati Bappa pictures as well your experience of Ganesh Chaturthi in Mumbai. Its indeed one of the most joyful of times that I remember growing up. The early morning aroma of the Patoli/khotto(hitto) Idlis wrapped up in jackfruit leaves/Modak ummm….!!. I made it a point to send Nisha to India (now she’s been twice) during Ganesh Chaturthi time to savor the times and bring back a small piece of my past & bappa’s divinity back with her. Nisha too enjoys reading your blog…keep writing!! So great to see Nisha. She is a big girl now! Time sure flies. 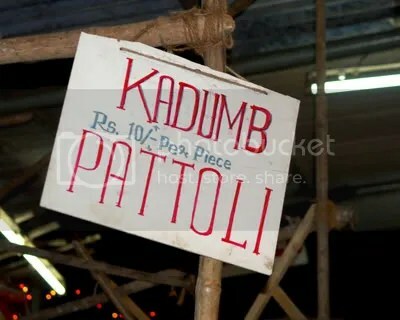 Next time you can go and bring back a bigger piece of bappa’s divinity for yourself! Yaay! Sounds like a lovely celebration! so colorful! heh! that coconut, jaggery and poha prasad is delicious! It is so quick and easy to make, don’t know why it is made only on special occasions! Need to fix that! Did you eat the Bajjiyas or Patholi? Tell us the truth now! and Meera had a blast the entire time! We can’t wait for next year! Then we should plan ahead and meet. Beautiful post Arunanna. Loved reading it. Though we didn’t have Ganapati at home, I loved the festivities seen all around. It felt divine. Here we had a small pooja this year – my in-laws have Ganapati at home, but this year, they could not keep it. So we did whatever we could. 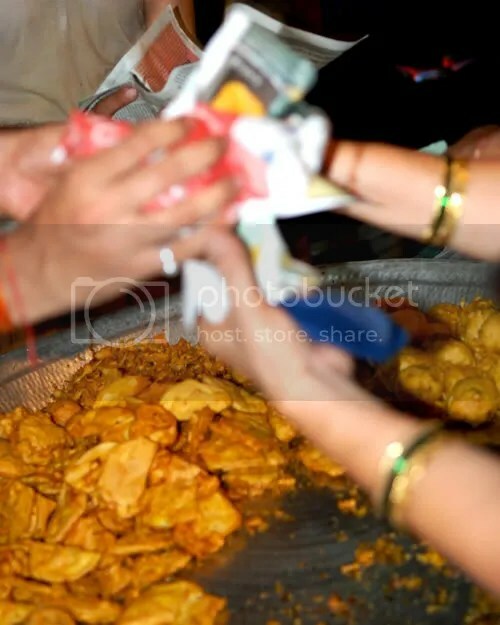 And yes, how can we miss the amazing food :D.
BTW, I loved the pic of your beautiful Gauri that you did at home! So nicely done and am sure it was more meaningful than what we do in mumbai with about 12 of my SIL and aunts doing it together. And yes, the food and the festive environment is just amazing. BTW, I was told you could grow haldi in pots!!! You could have fresh turmeric leaves! Imagine! Ha hA! How are you doing and how are your parents. Sorry, I did not get a chance to visit them on this trip. Arun here you go again making me nostalgic!!. We used to go to Wadala & Matunga for Ganapati. After offering our prayers we used to go to the stalls to eat. They used to have wonderful biscuit ambados and the appe where simlpy out of this world!! Thanks for the amazing pictures. Pradnya – Surprised you haven’t taken your kids for Ganapati to India in all these years! The bestest time! And yes! at Wadala, the eating bajjiyas was the best time. Even now, we as headed to wadala, my cousin and I were discussing about the tokens and which types of bajjiyas they had! 🙂 Fun Fun! Make a plan and go for it! Once the girls reach college, forget it!